also, my model contains plastic tubes - am I able to make them bendy? or illustrate they can bend? There are definitely ways to achieve the things you're asking about. Depending upon what you're trying to do, there are different possibilities. For example, you can use mechanisms functionality to model the motion of moving pieces. Or... you could use flexible components to simulate motion. For the "bendy" tubes... are they rigid plastic or flexible tubes. Either way you can make them appear "bendy". You can cleverly model them using curves that "flex". You could use a spinal bend. You could also use the warp tools. Or... you could use flexible piping with the Routed Systems/Piping module. I think the problem is... there are too many ways to do what you're asking. I think we need more information to help guide you to the right solution. Do you have a picture or a sketch of what you're trying to do? Can you give us more background to help us narrow down a solution for you? I'll be happy to explain some of the different techniques once we've narrowed it down a bit. i've made the pump for my model (the part), but I don't know how to represent how the pump for my model would actually work in real life. As in, a viewer would be able to play with my model and find that the pump can only extend a certain length. 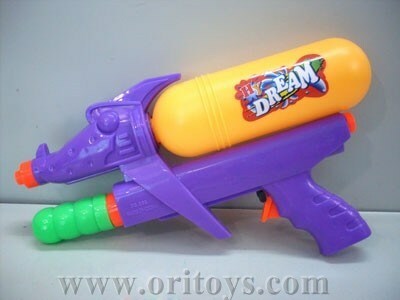 the watergun has a pipe similar to this, where it can bend and is semi-transparent - so right now, i've created a trajectory sweep to model the pipe and i've rendered it a semi transparent colour, my question is, is there any more i can do for my model's pipe? As in, when I've finished my 3D model for my watergun, is there a way for someone viewing my model to interact with the model and perhaps bend the pipe in any direction they want? For the pump, you could use a Mechanism connection. You can model the sliding action of the pump with stop points to represent the extents of motion. What type of Pro/E or Creo license do you have? Some licenses could be limited preventing you from using this feature. An alternative to simulate a range of motion might be to make the pump a Flexible component. This is a bit more advanced but would still get the job done. For the tube, your trajectory sweep likely won't allow for much motion (if any). You could use Flexible Piping to represent your tubing. This would provide the ability for the tubing to move as various components of your model moved. Anyone viewing your model can attempt to interact with it using the Drag command. However, if you haven't build the model and constrained it in a way to allow motion, you won't be able to do much. For instance, if you used a Mechanism connection for the pump, you WOULD be able to drag the pump handle back and forth within the motion limits you specified. The tubing probably wouldn't move though... unless one end was attached to the pump. If you'd used flexible piping and one end of the tubing was attached to the pump, moving the pump would cause the tubing to flex and move, too. Someone viewing your model wouldn't necessarily be able to interact with the model and move the tube in any direction they wanted, but some motion would certainly be possible. I can envision building the tubing model in some clever fashion to allow dragging... but without some advanced techniques you'll probably be left with more of a static model. Sometimes you can build a model and use an animation... or a pseudo-animation to demonstrate motion. Maybe if I knew your end goal, that would help me give you more helpful advice. For instance, do you just need an interactive CAD model ... or do you need an animation... a video for a webpage... or some other application? Thanks... write back with any other questions or information and I'll try to help out as much as I can. If you'd like to see more on Mechanisms, maybe you can take a look at some of the videos created by one of Planet PTC's Heroes of the Month, Kshetrabasi Manhanta (try typing that without looking!). His profile page is HERE... in the middle of the page you'll see a series of videos discussing mechanisms. I'd take a look at the one discussing the basics of a Slider connection.